Things are winding down in Victoria, B.C. ; the 30th edition of the annual Victoria Day weekend scooter rally saw unexpected sunshine and the streets of British Columbia’s capital were filled with scooters (and scooterists) from all over Canada and the U.S.
Sunday brunch at Pagliacci’s is always part of the itinerary. Pag’s is well-known for its entertaining brunch menu. The food’s good, you should eat there whenever you visit Victoria. Which I will again, sometime before I die. 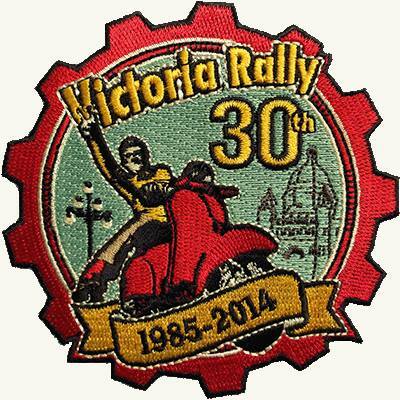 The rally organizers always have a nice patch to sell. I’m guessing this one will be particularly sought-after among those who didn’t make it to the rally. Click on the thumbnail to see it in its larger-than-life glory. The rally even made the local evening news.